Often, games with silly names are bad. Like looking at the cover of a book, reading a game's title is often the best way of figuring out whether it will be good or not. Sometimes, however, one is surprised - take, for example, The Dungeon Of EEEvil, which sounds like it must be some terrible dungeon crawling game. Not so, however. While it is, in fact, a dungeon crawling game, it is not even slightly terrible. All joking aside, it is a surprisingly large, entertaining, and idea-rich game, though simple in concept. You play as a knight who wakes up inside of a dungeon and must free himself. As you explore the three floors and numerous rooms of the castle, you fight off zombies, avoid bats and traps, collect items, solve puzzles, fight bosses, and gradually piece together the story of the castle's long-gone inhabitants. It's a simple model - something like a Zelda/Rogue mashup - but one that is entertaining, and the storyline, though it's a little silly and doesn't seem to have had much effort put into it, is more interesting than it rightfully should be and is in spite of itself a little bit cool, which surprised me. There are touches of humor, but somehow in spite of its name and an air of silliness about certain aspects of it, it isn't a game to laugh at, and that suprised me too. Besides this, the game is larger than it seems at first - it takes forty minutes to an hour to get through it, which, while not long, is certainly not terribly brief by our warped indie standards - and the bosses and puzzles, while not very numerous or difficult, are thoughtfully designed and unique, something that keeps you engaged rather than turning you off. Aesthetically the game is rough, but far from an eye (or ear) sore. The graphics are pixellated, and the various objects are mismatched in resolution. Maybe this shows a lack of polish, but it doesn't look altogether bad; the game, indeed, has a quirky charm to its blockiness. Sound isn't extensive. There are a handful of nondescript effects, and a few tracks of music. The music is rough around the edges and low-fi, like the graphics, but the tunes are interesting and not annoying in the least (though it's not a very frustrating game). The game is far from perfect, of course. It's quite unpolished, though there are no gameplay bugs per se, just some cut corners - an awkward room transition here, a health meter that continues to go down after you're dead there... none of it kills the experience, but some of it is just odd. You might find it charming or annoying, depending on your disposition. 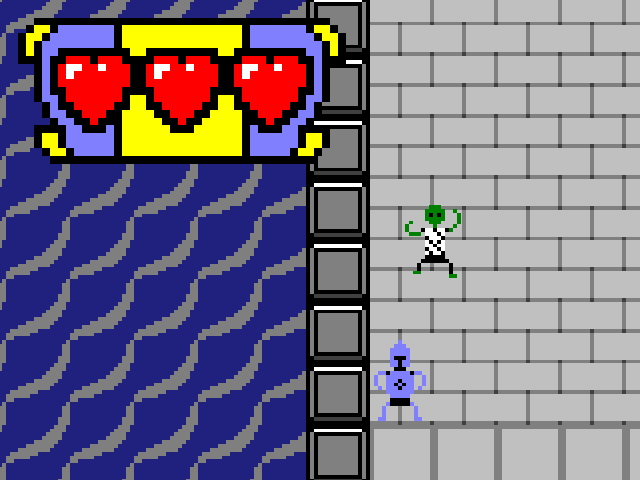 The Dungeon of EEEvil is a lot deeper than it at first seems to be, and exudes heart and fertility of ideas. Even if it's got some serious laziness here and there, it's still a surprisingly good time. Recommendations: The 2 people who like Dungeon Of EEEvil also like the following games. and cool and the last boss is awesome. does need a save option. More enjoyable and addictive than it first appears. The graphics have their own quirky charm, and the gameplay is simple and fun. My only complaint is the lack of a save option. I look forward to a sequel!